Prominent & Leading Manufacturer from Mumbai, we offer nbr o rings. We are a leading manufacturer and supplier of NBR O Rings. 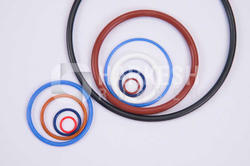 Nitrile is the most widely used elastomer in the seal industry and commonly used in o-ring and sealing applications. The popularity of nitrile is due to its excellent resistance to petroleum products. Looking for Rubber Valves ?